High Speed Foil Fusing Supplies - THERM-O-TYPE Corp.
For best results, thermal transfer plate should not be used with a honeycomb style chase. A Bunter Post style chase works best. Bunter Posts can be used but screwing the thermal transfer plate down to the chase provides the best heat transfer. Thermal transfer plate pricing does NOT include countersunk mounting holes. Customers who want the thermal transfer plate machined for mounting holes must provide position information so these holes can be machined in the plate. There is a $25.00 charge for drilling and countersinking four mounting holes. Thermal transfer plates are designed to fit on chases/machines configured for thick foil stamping/embossing dies. High speed foil fusing does NOT work with traditional stamping foils. 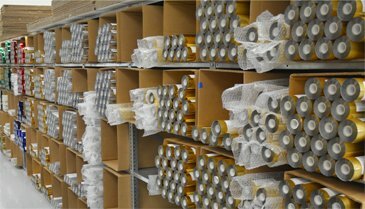 For information on fusing foil inventory and pricing, please contact THERM-O-TYPE.